various lollies, M&M’s, cake decorations, sprinkles, etc. Step 1. Sift icing sugar into a large bowl. Add milk a little at a time and stir until you have a thick, paste-like icing. Step 2. 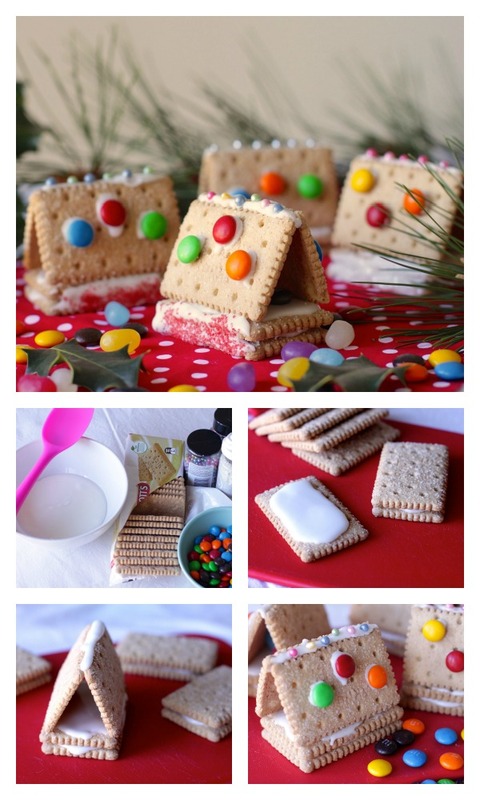 Spread a little icing onto one biscuit and top with another to form the base of a house. Spread icing onto this top biscuit as well. Repeat to make six bases. Step 3. Spread some more icing along the long edge of one biscuit and press it against another to create a V shape. Place this upside down onto a base, using icing to adhere. Repeat to make six houses. Step 4. Decorate the houses with lollies, etc. using icing to stick them to the roof and base. You can use any rectangular shaped store-bought biscuit, or make your own. Coloured sugars, cachous and 100s & 1000s used for cake decorating would be perfect here. You can make these Christmas tree brownies in one giant round and just slice and ice. You can make these Snowman doughnut sticks with store-bought doughnuts and they are so much fun. If you like a round shortbread disc then this Christmas shortbread can be cut into “Petticoat tails”. These little Meringue Christmas trees are dipped in chocolate and decorated to your liking.